Today, June 1st, is Yom Yerushalayim, Jerusalem Day, marking the reunification of Jerusalem during the Six Day War in 1967. This is both an Israeli state holiday and a rabbinically mandated minor religious holiday, which means it’s celebrated both with parades and liturgy. Jewish holidays have a funny way of changing over time. New eras bring new significance to ancient holidays. Perhaps there’s no holidays that exemplifies this more than Tu BiShvat. Tu BiShvat (which literally means the 15th of the Hebrew Month of Shvat) is also known as Rosh Hashanah L’Ilanot, or the New Year of the Trees. The holiday was originally something of a bureaucratic anniversary; the Bible prohibits using the fruit of young trees and the prescribes donations of fruit from mature trees. Tu BiShvat marks the date from which the age of trees are calculated for these purposes. Of course, when the Jews were exiled from Israel, the rules about waiting for trees to mature became less relevant to a landless people. And with no Temple in Jerusalem, the rules about donating fruit fell by the wayside as well. So, to abuse an agricultural metaphor, the holiday lay fallow until medieval mystics refashioned the holiday as a Kabbalistic tour de force. Adapting the Passover seder to their needs, the Kabbalists of Tzfat gave the holiday a signature ritual, destined to confound Hebrew School students for generations to come. You can read a translation of their original text, known as Pri Eitz Hadar, online courtesy of the Open Siddur Project. Fast forward a few hundred years to the 1800s and the advent of Zionism. As Jews around the world dreamed of returning to their homeland, the holiday celebrating its produce took on new significance. 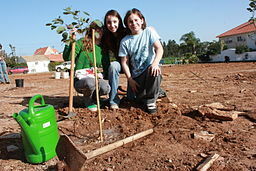 For many American Jews, the holiday will forever be linked with receiving the “little blue box” at Hebrew School to collect donations for the Jewish National Fund‘s efforts to plant trees in Israel. JNF celebrates this legacy still with its Tu BiShvat Across America campaign, complete with activities for kids, sermons from a variety of Rabbis, and haggadot for holding your own Israel-centered Tu BiShvat seder. More recently, the holiday has become a rallying moment for environmentalists who extend its message beyond Israel to remind us of the importance of trees around the world. Hazon’s Tu BiShvat website emphasizes this take on the holiday, offering resources for celebrating the holiday through an environmental lens today. WALTHAM — More than 20 professors from universities around the world recently gathered at Brandeis University to complete a two-week intensive study of Zionism and Israel, followed by a weeklong seminar in Israel. Now in its second year, the Summer Institute for Israel Studies is intended to assist professors in the design of new courses for their curricula on Israel.